We’ve had many customers over the years and we’ve found a way to repay them! How do I Earn Green Points? You can earn green points a few different ways. Earn 200 bonus points just for signing up. If you are an existing customer simply email sales@livingtowers.com if the points are not automatically applying to your account. 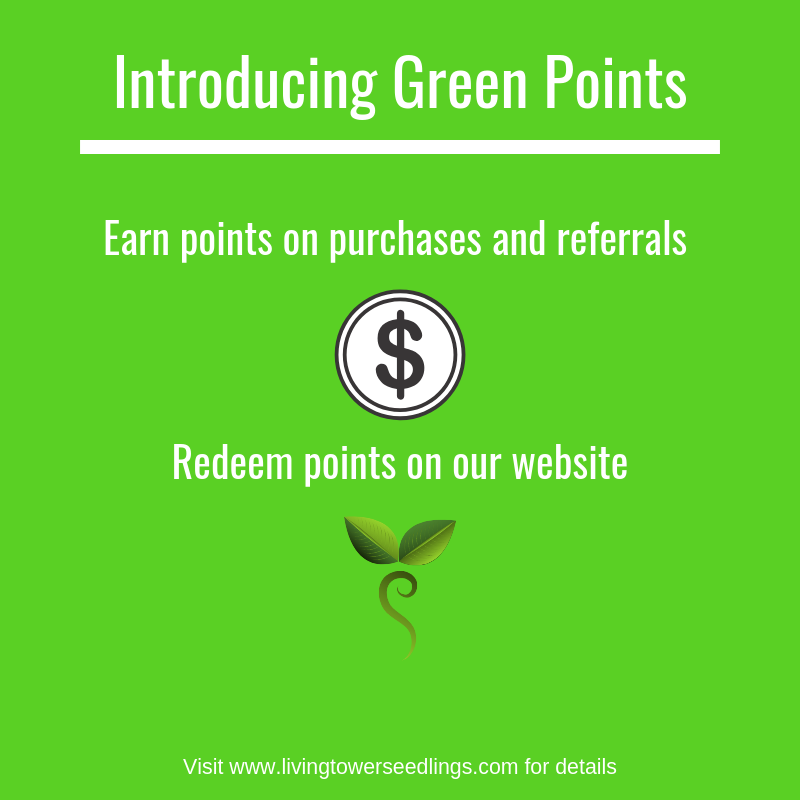 Earn “Green Points” on every purchase you make at www.livingtowerseedlings.com. When you reach 400 points you can redeem the points for a $5 coupon to spend at www.livingtowerseedlings.com. Share our website to Facebook and earn 50 bonus points. Like our Facebook page to earn another 50 bonus points. Share a picture of your seedlings within two weeks of your order to the Facebook Group “Tower Gardeners User Exchange Group” and tag Living Towers and earn 50 bonus points. Absolutely! We love referrals and when you refer a friend you’ll receive a $5 coupon when they place their first order after signing up through your link. We love new customers too so we give them a 10% off coupon when they sign up through your link too! You can find all of the details at www.livingtowerseedlings.com/green-points/. I would like to earn green points on my purchases.